Knowledge Retention: We share knowledge within our team to build an institutional memory that our clients can rely on. As our client, you won’t need to spend time re-training individuals. Flexibility: We have the flexibility to juggle deadlines and expand and contract resources dedicated to projects as appropriate, avoiding idle time. Adaptability: We can start on short notice when your internal resources are overloaded. We’re savvy about how to seamlessly integrate into your team, and can quickly assess team dynamics, project scope, and understand your needs. We’ll adapt to your existing processes, procedures, and tools, proposing value-added improvements if desired. 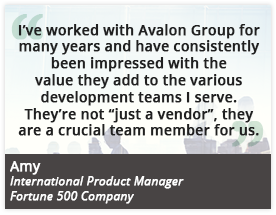 Trust: Our staff is a dedicated team of professionals who go the extra mile to make sure your project is a success. Whether it’s providing a quick response to a question or a key document in a time crunch, we’ve got your back.